If veterinary medicine were a patient of ours, many of us would be racing for the crash cart—its vital signs aren’t good. Applications to veterinary school have dropped worrisomely from the days of old (I’m Class of 1980), student debt is soaring, too many pet owners can’t afford our services, and far too many pet parents think optimal pet health comes in a bag of super-premium food, rather than via regular veterinary visits. Many experts even point to the fact the basic raw ingredient of companion animal practice—enough pets to meet demand of existing and new pet owners—will reach a crisis point in the near future. Today, as a profession and as people who share our homes with pets for comfort or therapy, our ranches with horses for work or pleasure, or depend on animals for our livelihood or research, we face a looming crisis. Simply put, the glass isn’t half full or empty when it comes to veterinarians—it’s running dry. Allow me to look back using my own career as an example of what I mean. Becoming a veterinarian was a childhood dream. When I got the coveted thick envelope from Washington State University College of Veterinary Medicine in 1976, I knew I’d beat the odds and would be able to finish the journey to become a veterinarian. It was a calling that started when I was a seven-year-old child on a farm/ranch in rural Southern Idaho. As I recall, there were about eight applicants for every opening at WSU-CVM for a limited number of students. I was only a junior in college, but got in. 1) You’ve made a mistake. You should never have gone to veterinary school. 2)You should have been an MD or DDS, instead of a DVM. 3) If I had it to do all over again, I wouldn’t have been a veterinarian. In fact, the opposite was true. Times were tough then, but recent graduates told us that while the work was hard and the money was tight, they absolutely loved veterinary medicine. Our classmates’ career choices included mixed animal, companion animal, equine, poultry (I remember being shocked at how much they made), military, meat inspectors, and research. One made a living being a veterinary medical illustrator, another became a DVM, JD. When we left school and started jobs, by and large we found colleagues ready to mentor us, encourage us, cover for us, offer us career paths, use jobs as stepping stones to other opportunities, let us buy in or set in motion a buyout. I had just such a colleague/mentor/friend in Colorado State University graduate, Bill Strobel, DVM, who let me become a partner in Green Acres Pet Hospital in Twin Falls, Idaho, right out of veterinary school. It was the summer of 1980 and I learned more than I ever expected about parvo (that was the year of the parvo pandemic). Yet, he also taught me how to hone my surgery skills, read radiographs, “edutain” new puppy owners, handle the final grace with pet owners, inspire team members, get clients to say yes, manage time, and have fun. He also stressed balance between a personal and professional life. It was early in my career that I got to meet my veterinary school hero, Ross Clark, DVM, from Tulsa, Okla., who I only knew from the pages of Veterinary Economics magazine, but so admired from his knowledge of the sales, customer service, leadership, motivation, marketing, promotion, hospital design, and financial side of veterinary medicine. Dr. Clark helped me early in my career—as if I were his son—with advice, coaching, and encouragement that continues to this day. 1) Becoming a partner right out of veterinary school. My eternal gratitude, Dr. Strobel. 2) Making enough money to pay my student loans, make house payments on a new home, and start funding my retirement. 4) Owning or co-owning six veterinary practices, mentoring dozens of veterinarians who went on to open their own practices back home or in other states, buy practices, and move on to industry or corporate veterinary medicine. 5) Writing for veterinary magazines and lecturing for more than 30 years, authoring 25 books that have sold more than eight million copies, doing network TV for over two decades, writing a syndicated vet/pet column for over 15 years, visiting 87 countries on seven continents, being married to the love of my life, Teresa, for over 40 years… I could go on and on. These rich blessings underscore and inform what I’ve always said: veterinary medicine is the greatest profession on earth. I’ve echoed the beliefs and words of literally thousands of successful veterinarians who realized veterinary medicine didn’t have to be a purely altruistic profession, and you didn’t have to take a vow of poverty to be a DVM. I, and the vast majority of my classmates, have been financially successful and emotionally wealthy. Personally, I’ve always encouraged people to become veterinarians and have helped dozens to get into veterinary school. To even think of discouraging a pre-veterinary student from pursing this noble career, or telling a current veterinary student they’ve made a mistake and are not going to enjoy practice and furthermore are going to struggle to make a living, is reprehensible. Taking it further, what about discouraging all those kids from becoming a veterinarian after they’ve watched us work our magic, helped out, and loved a pet. I’ve witnessed this dozens of times and heard these tragic conversations from the trenches hundreds of times. How many of us are taking advantage of local career days to talk up the greatest profession on earth? I’ve been traveling around the U.S. speaking at veterinary schools about Fear Free, and when I give a positive message about veterinary medicine (their career choice) and their life-path (the ability to be financially successful and emotionally wealthy), it’s like I’ve pulled a nagging tooth, lanced an abse$$ (not a typo), or given them an IV “high five.” The drum beat of negativity is replaced by the realities of hope and the ability to thrive, not just survive, in the greatest profession on earth. 1) In 1980, there were 7,014 veterinary students enrolled; divide by four and you get about 1,754 seats for 7,286 applicants. In 2017 the total number of students enrolled was 13,019; divide by four and you get about 3,255 seats for 7,076 applicants. 2) Put another way, there was about a 4.2:1 ratio of applicants to seats in 1980 versus 2.2:1 in 2017 (37 years later). 3) There were 7,286 applicants in 1980 versus 7,076 applicants nearly four decades later. I’m doing all I can to sound the clarion call without unnecessary hyperbole. We need both more graduating veterinarians and veterinary school applicants. The good news is that the quality of applicants to veterinary schools is still high. Far from scraping the bottom of the proverbial barrel, we’re still taking cream off the top. But anytime you have a limited number of applicants, there are serious areas for concern and action. Veterinary unemployment is under one percent. I’ve spoken with hundreds of veterinary practices that can’t find a veterinarian to hire. 1) Plant seeds. 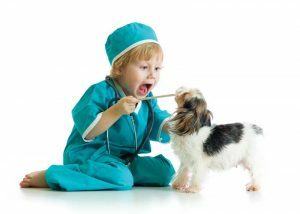 Put that stethoscope in that little boy’s or girl’s ear and let them know they should consider becoming a veterinarian. Go to career days at the local schools and be more passionate than anyone else there. When someone finds out you’re a veterinarian and says, “I always wanted to be a veterinarian,” rather than making invisible eye rolls, say, “It’s never too late to make that dream a reality.” Make converts! 3) Increase value so you can increase wages. The public wants the veterinary profession to look at both the physical and emotional well-being of animals. The public also is willing to pay more for services if we do both. I’ve promised Ricky I’ll get him a $5,000/year higher job offer if he graduates from veterinary school Fear Free-certified. (Fear Free certification is complimentary to all veterinary and veterinary nursing students, all veterinary school faculty, residents, and employees; it also is free to all shelters when that program is completed in 2019.) I’m not going to pay Ricky out of my pocket; I don’t have to. 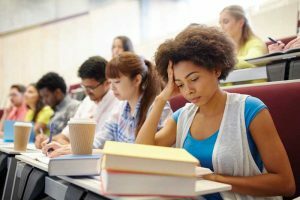 There were hundreds of instances in the Class of 2018 where graduates received $1,000 to $5,000 higher job offers if they were Fear Free-certified. Practices wanted to bring the high-touch skill set into the practice (while still valuing a high-tech skill set) and were willing to pay. According to an American Veterinary Medical Association (AVMA) report, each $1,000 higher starting salary is equivalent to a $25,000 reduction in debt over a career (I know, one of those Freakonomics deals). Boom, this blows up Ricky’s debt problem. I’m willing to act as a go-between for the Class of 2020 where we see the value of a veterinarian differently (see how I tied in 2020 with hindsight?). I pledge to set up a way to connect veterinary graduates who have completed all complimentary Fear Free courses with veterinary practices willing to pay them $5,000 more. Furthermore, we’ll follow these newest colleagues during their first year of practice. I’m willing to put my money where my mouth is. I want to be part of the solution of growing the greatest profession on earth. Marty Becker, DVM, writes every other month for Veterinary Practice News. He is a Sandpoint, Idaho, practitioner and founder of the Fear Free initiative. For more information about Fear Free or to register for certification, go to fearfreepets.com. Columnists’ opinions do not necessarily reflect those of Veterinary Practice News.